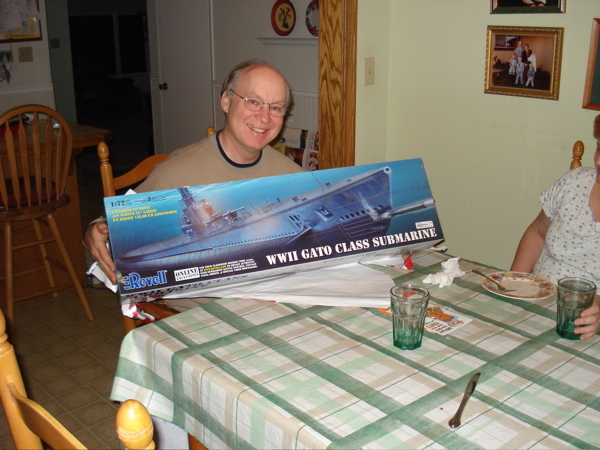 I got this model for my birthday from my kids back in November of 2006. I just thought I would start to docuement the build. 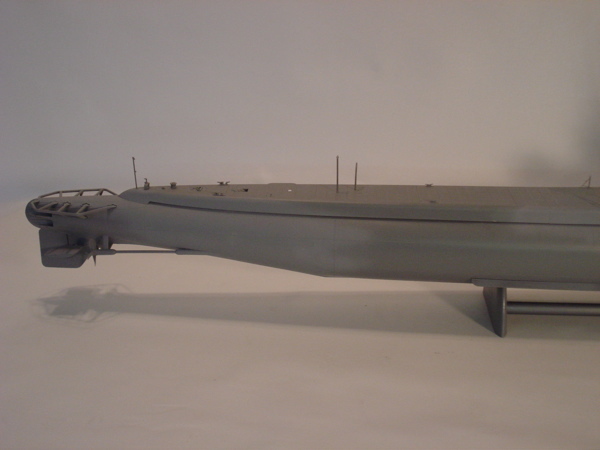 I have been working on it for a while – I put the hull haves together and assembled the halves for the bow and stern and then it sat on the shelf for a while as I had some other projects on the front burner. They are finished now and it’s full steam ahead. One thing I was hoping for and was actually delaying the build was the anticipated availability of some aftermarket photo etch parts. That just hasn’t happened though. 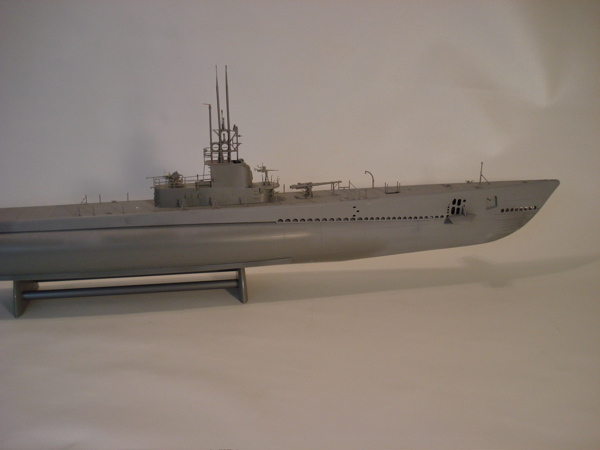 White Ensign Models in the UK has had a set in production for some time now according to their web page – but I guess it still isn’t ready for prime time. (6-4-07 I just got and e-mail from Dave Carter saying that the pe won’t be done till toward the end of the year). 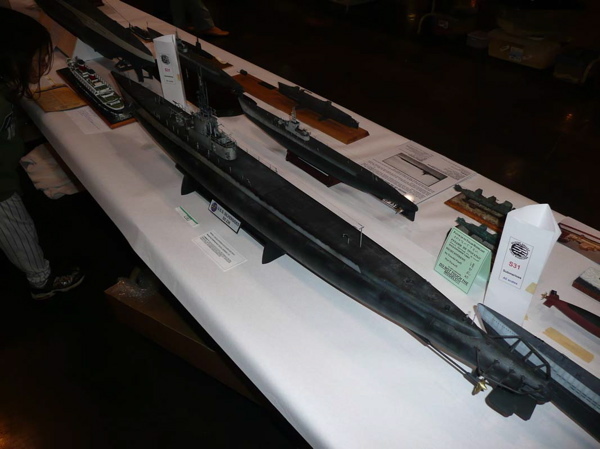 This model is really big and will rival the length of my Yamato in size. 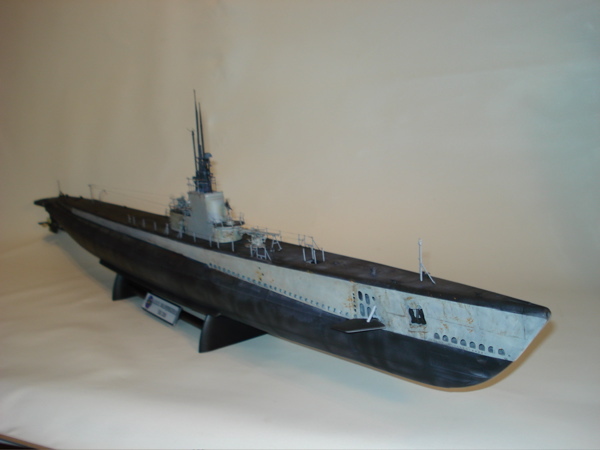 When I set out to build a r/c submarine – this is what I had in mind – but the model wasn’t out yet. 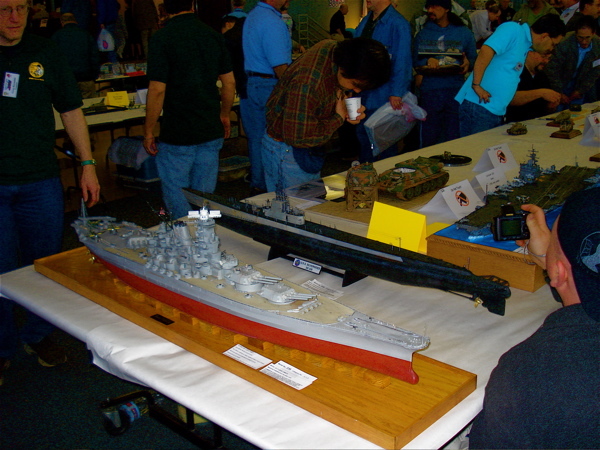 I have considered making this r/c also – but it’s kinda been there done that now – besides the cost is considerable. This will be a static model and should look really nice when it’s finished. 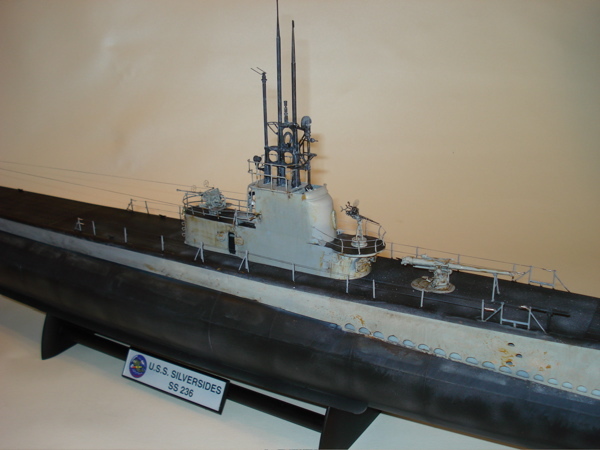 During the build I discovered that the ladder leading from the foredeck to below deck was nowhere to be found – I had to scratch build one. 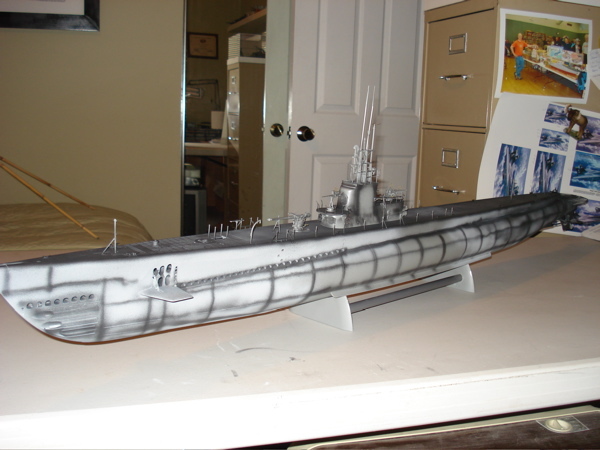 The following picture documents the shading and painting of the sub. 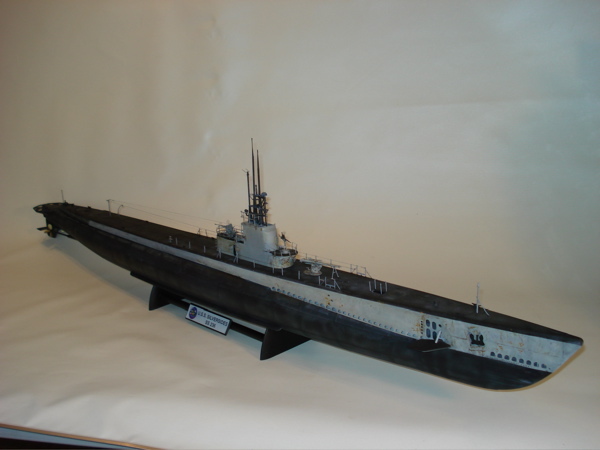 I’ve added several photoetch parts from a set I purchased from Nautilus Models – I was able to replace the gun seats and sights which made a great improvement in these areas. The two exterior doors on the sides of the sail were removed leaving openings which are correct. 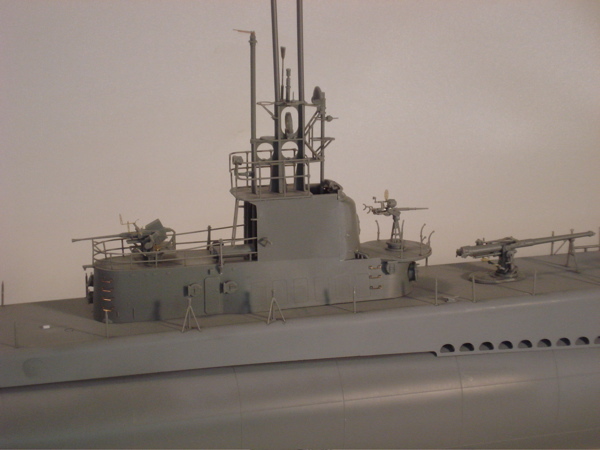 The forward periscope was reduced 2/3 inch in height (48 inches full scale). The eight rectangles on both sides of the sail were removed as they are incorrect. The radio antenna was rigged correctly with insulators using EZ line. I also added tension springs at each end of the side rails. The breather (part #49) was removed – this is incorrect. The broom was removed and replaced with an antenna similar to that on the other side of the tower. In preparation for the upcoming SVSM model show I’ve modified the black deck paint pattern from a straight line to a wavy pattern. This deviates from the painting instructions but to me is more realistic and pleasing to the eye. 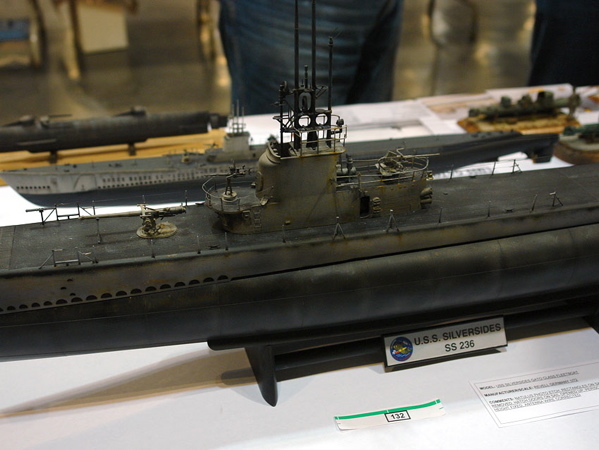 There were so many changes to these submarines over their careers that I felt justified. 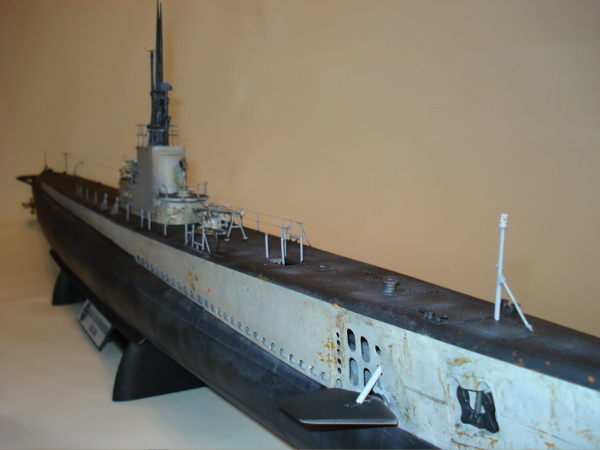 I also gave the model an over-spray of black to darken up some areas and give a representation of a more weathered look- in addition I accentuated areas that have rusted using the Tamiya weathering sets that I recently purchased. I followed this up with a final spray of Model Master clear flat. Some might say it looks too dark now – I think that it just looks sinister.